If you’re confident with your single and double stitches, then you’re ready for the next step! Join our friendly and fun sessions making little crochet projects and learn how to make trebles, picot and scallop edgings, textured crochet stitches, practise some mindfulness and more! 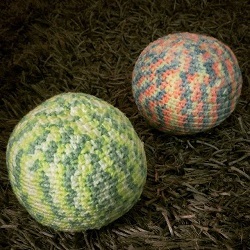 This next level course will help you build your crochet skills and feed your crochet addiction! If you’re already confident holding the hook and making single and double crochet stitches, this is the right course for you. You’ll learn new stitches such as the trebles, cluster stitches, V-stitches, be introduced to textured crochet and will understand the meaning and importance of gauge as you make fun little projects! And of course, there’ll be some mindfulness added to keep you calm! 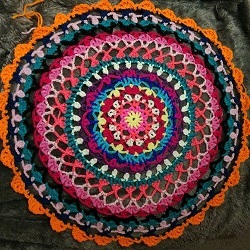 • Make the “I Love Mandala” using V stitches and cluster stitches Initial materials provided but bring along any yarn or crochet hooks you may have at home. You need to be confident with crochet basics: chain stitches, single crochet stitches and double stitches.